This is a sponsored post by F-Secure Freedome VPN. There are plenty of reasons you might want to use a virtual private network (VPN) but, for most of us, the primary purpose comes down to privacy. If you're in a coffee shop, using public Wi-Fi at the airport or somewhere else, it's incredibly easy for a would-be hacker to snoop on what you're doing. Maybe you're buying goods from Amazon, or sending a private e-mail, or streaming a TV show you love. No, you don't need to be secure just because you aren't being nefarious, you should keep things secure because what you're doing online is your private business. And, a lot of the time, it's your life. It always amazes me when I hear that someone doesn't use a VPN or, perhaps worse, doesn't really know what a VPN is. Think of it, basically, as a simple tool that blocks others from viewing what you're doing online, and from others knowing exactly where you are. It might seem like shady business – the act of keeping yourself anonymous in an age where it seems like but it's actually a really common tool for keeping yourself safe from prying eyes and hackers that would otherwise have pretty bad intentions. VPNs range in cost and quality. There are enterprise solutions protecting entire businesses from danger, and there are smaller more consumer-friendly services made for you and I. And while it might seem like something complicated that only someone with computer know-how can do, the whole process of setting up a VPN is as easy as installing a small piece of software and then, after that, simply flicking a light switch. That's right – you can easily turn VPN on and off depending on when you need it. There's no jumping through hoops, crazy configurations or coding required. OK, now you know it's easy and you should get one, so how do you get started? First, by finding a VPN service that fits your needs. There are plenty. One worth checking out is F-Secure's Freedome, which costs $49.99 for a year with support for up to three devices. That's perfect for your home computer, a laptop and a smartphone. Have more devices, or want to share with the family? A $59.99 tier provides support for 5 devices, while a $79.99 annual protects 7 devices. Freedome provides plenty of the benefits you can expect from a good VPN service. That includes protected browsing – folks can't snoop on you easily because you're basically creating a shield over your data, or tunnel if you will. You can also skirt around content that might be blocked depending on your location. It also has all of the functions that you need to browse content that might be blocked in some countries (by changing your virtual location) and the ability to keep you anonymous. Say you take a trip to a country where Netflix isn't available, for example. Normally you might not be able to stream your favorite movies and TV shows but, with a VPN like F-Secure Freedome, you can change your virtual location and access content that would otherwise be blocked. Simply open the software, choose the location you want to make it look like your browsing from, and you're good to go. This works if you're in Europe, for example, and maybe in a country where Netflix doesn't offer service for licensing or other reasons. Simply open up Freedome, switch your location to make it look like you're trying to access from the United States and, voila, Netflix works again. And yes, it's perfectly legal. The anonymous features also allow you to skirt targeted advertising, too, since ads won't actually be able to track your browsing habits. The same goes for malware: Freedome is constantly tracking for cookies and other software that might affect your browsing experience, and keeps you safe from that kind of malware. Speaking of targeted advertising and tracking – it's important to know that F-Secure doesn't track what you're doing online either. The company promises "total anonymity – even from us" and says it doesn't ever use your contact details, user name or log your traffic. That might seem pretty standard, but it's actually not promised by every VPN provider on the market – some actually do track user surfing habits. And if you think you're not actually being tracked and targeted by outside networks, and that a VPN actually isn't required (it is, by all accounts, for almost everyone on the Internet these days,) you can check out F-Secure's new tracking tool for Freedome. It provides a real-time map that shows where sites and other advertisers might be trying to track your browsing habits from. You can record that data and see the all of the results as you wish. Don't worry, any recordings are also automatically deleted by F-Secure after three days. Freedome has features that other VPNs don't, too. That includes Apple Watch support, so you can easily turn on the VPN right from your wrist when you need it – like in a café – and turn it off when you don't, like when you're at home browsing on your own Wi-Fi network. It's hard to sit here and try to convince you why you should try a VPN. Usually, it seems like folks gravitate toward protecting themselves after something dangerous has already happened. Maybe they lost a password in a hack, or maybe you accidentally installed some malware. But now, as we're using our computers and smartphones more and more, entering in personal data all around the Web, we're at risk for even more damaging things, like identity fraud. Worse, how many of us actually want people to see what we're doing online? We don't just setup cameras for the world to view into our homes, do we? 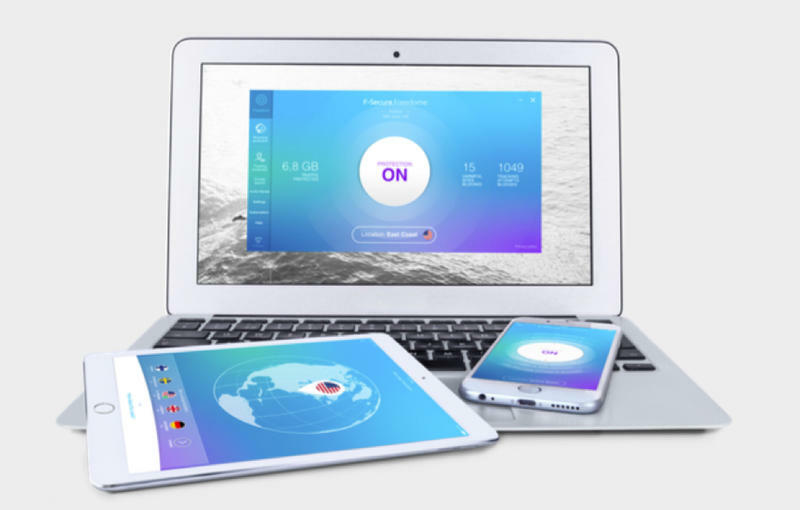 So treat your Web browsing habits similarly, and sign up for a VPN like F-Secure's Freedome. You'll find support for Windows (yes, even new Windows 10 builds), Mac, Android, iOS and even Kindle Fire OS. It's available in North America, Latin America, Asia and Europe, and there's no limit on bandwidth. Don't like the service? Cancel at any time.